LABOR Volume 26, No. 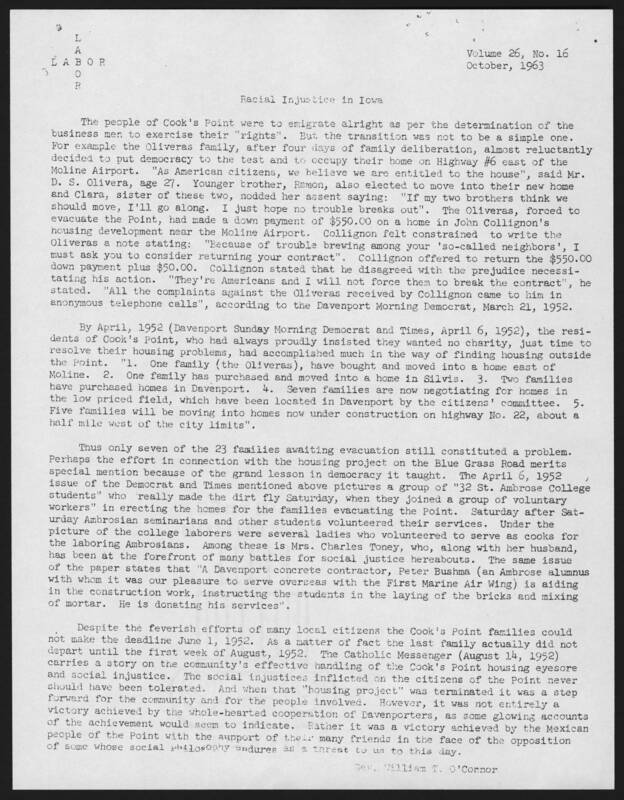 16 October, 1963 Racial Injustice in Iowa The people of Cook's Point were to emigrate alright as per the determination of the business men to exercise their "rights". But the transition was not to be a simple one. For example the Oliveras family, after four days of family deliberation, almost reluctantly decided to put democracy to the test and to occupy their home on Highway #6 east of the Moline Airport, " As American citizens, we believe we are entitled to the house", said Mr. D. S. Olivera age 27. Younger brother, Ramon, also elected to move into their new home and Clara, sister of these two, nodded her assent saying: " If my two brothers think we should move, I'll go along. I just hop no trouble breaks out". The Oliveras, forced to evacuate the Point has made a down payment of $550.00 on a home in John Collington's housing development near the Moline Airport. Collington felt constrained, to write to the Oliveras a note stating: " Because of trouble brewing among your 'so-called neighbors' I must ask you to consider returning your contract". Collington offered to return the $550.00 down payment plus $50.00. Collington stated that he disagreed with the prejudice necessitating his action. " They're Americans and I will not force them to break the contract", he stated. " All complaints against the Oliveras received by Collington came to him in anonymous telephone calls", according to the Davenport Morning Democrat, March 21, 1952. By April, 1952 ( Davenport Sunday Morning Democrat and Times, April 6, 1952), the residents of Cook's Point who has always proudly insisted they wanted no charity, just time to resolve their housing problems, had accomplished much in the way of finding housing outside the point. " 1. One family ( the Oliveras), have bought and moved into a home east of Moline. 2. One family has purchased and moved into a home in Silvis. 3. Two families have purchased homes in Davenport 4. Seven families are now negotiating for homes in the low priced field, which have been located in Davenport by the citizens' committee. 5. Five families will be moving into homes now under construction on highway No. 22, about a half mile west of the city limits". Thus only seven of the 23 families awaiting evacuation still constituted a problem. Perhaps the effort in connection with the housing project on the Blue Grass Road merits a special mention because of the grand lesson in democracy it taught. The April 6, 1952 issue of the Democrat and Times mentioned above pictures a group of " 32 St. Ambrose College students" who really made the dirt fly Saturday, when they joined a group of voluntary workers" in erecting the homes for families evacuating the Point. Saturday after Saturday Ambrosian seminarians and other students volunteered their services. Under the picture of the college laborers were several ladies who volunteered to serve as cooks for the laboring Ambrosians. Among these is Mrs. Charles Toney, who, along with her husband, has been at the forefront of many battles for social justice hereabouts. The same issue of the paper states that " A Davenport concrete contractor. Peter Bushma ( an Ambrose alumnus with whom it was our pleasure to serve overseas with in the First Marine Air Wing) is aiding the construction work, instructing the students in the laying of the bricks and mixing of mortar. He is donating his services". Despite the feverish efforts of many local citizens the Cook's Point families could not make the deadline June 1, 1952. As a matter of fact the last family actually did not depart until the first week of August, 1952. The Catholic Messenger ( August 14, 1952) carries a story on the community's effective handling of the Cook's Point housing eyesore and social injustice . The social injustices inflicted on the citizens of the Point never should have been tolerated. And when that " housing project" was terminated it was a step forward for the community and for the people involved. However, it was not entirely a victory achieved by the whole-hearted cooperation of Davenporters , as some glowing accounts of the achievement would seem to indicate. Rather it was a victory achieved by the Mexican people of the Point with the support of their many friends in the face of the opposition of some whose social philosophy endures as a threat to us to this day Rev. William T. O'Connor.